Andy had been wearing a rash guard top in Hawaii for a few years before I discovered how awesome they are. I won’t go to Hawaii without one now. What makes rash guard tops so valuable? The built in sun protection is the main reason I recommend a rash guard top. Whether we’re kayaking, snorkeling, or just spending a day sightseeing or at the beach, these tops offer exceptional sun protection – usually the equivalent of SPF 50. Since rash guards offer their own sunscreen, you don’t have to use as much sunscreen. Plus you don’t have to worry about missing a spot covered by your rash guard or reapplying. Studies have shown that chemical sunscreens, especially ones with Oxybenzone, can be damaging to coral. With a rash guard top, less sunscreen required and less damage to the coral. Surfers wear rash guard tops to protect their skin from scraping lava rocks and sand if they fall. So, when we wear our rash guard tops we feel like we look like a super cool surfer — well, sort of. Rash guard tops are not just for being in the ocean. 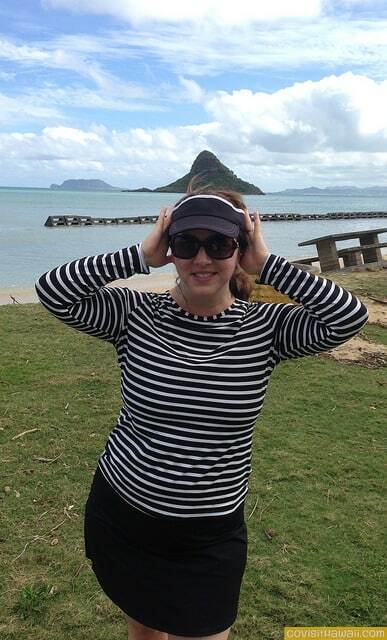 As you can see from this photo, I’m wearing a rash guard while we were out sightseeing on Oahu. Where to buy rash guard tops? Since rash guard tops are not commonly sold in department and discount stores, they can sometimes be tricky to find. The following retailers usually carry rash guards year round. We’ve seen rash guards spelled with one or two words, so try both options when searching online. – Hanes.com sells quick-drying, moisture-wicking shirts with UPF 50 built in. They’re not advertised as rash guards, but we believe they can be used for the sun protection purposes of rash guard tops. They’re the least expensive shirts we’ve found with UPF 50. – When you’re in Hawaii, stop in one of the surf shops in Hawaii. Do you have a rash guard top? How do you like it? Where did you find your top? I completely agree with this!! I got a bad burn while snorkeling at Hanauma Bay. Rash guard would have helped me a ton! Rash guards are a must! We got ours at Lands End as well. Better for the environment as you said and prevents you from burning if you forget to apply sunscreen! You can get them cheap at the Wall-Mart across from the Ala Moana Shopping Mall, just outside of Waikiki. I just got a few rash guards from Cabana Life for my upcoming trip to Maui. After one of the worst burns I’ve ever gotten in Haunamu Bay, I went ahead and purchased a full dive skin (like a wetsuit but thinner like rash guards) for $100 at a dive shop. I wear it every time we snorkel and I love the feeling of protection and security it provides. Plus, no sun screen needed except my face! we definately need rash guards for our trip to Hawaii next month. Thanks for a great tip! But we live in Denmark so ordering from lands end cost as much in shipping and taxes as four shirts. I know the price will be high if we buy at the hotel, but how much shoul we expect på pay e.g. At the Flying Fish at Sheraton in Kona which is our first hotel? We are all very fair skinned so we will need the protection from day one…. Hanne – just a guess, but somewhere in the range of $30 to $50 per top. Contact your hotel directly to verify they have rash guard tops and get more accurate cost information. Rash guards are AWESOME. I spent my youth slathering on “tanning lotion” with good old SPF 2 at the lake, but as an adult I am obsessed with not getting skin cancer. All of mine (long sleeve and short) are Roxy brand–they make them in super cute designs and colors for women and can be purchased very affordable for between $25-$35 USD at Amazon.com. I wear mine any time I am going to be in the sun even though I tend to tan rather than burn–tanning is just as bad for your skin after all. Since they are very cute, it’s no hardship! The only downside is that they can feel sticky in hot weather if you are not in and out of the water, so you sort of feel like you are sweating all the time even when you are not, but you get used to it. I wouldn’t go to any place, tropical or not, without packing one for outdoor adventures, but when you are being lured into turquoise waters 24/7 they are indispensible! Is October a good month to go to Hawaii? How many islands should you visit during your Hawaii vacation?